Nails Inc - Superfood Kale Base Coat - I'm not sure whether this did anything for my nails. Something I was happy to use up but not something I would repurchase. OPI - RapiDry Top Coat - This dragged nail art, not something I would repurchase. Leighton Denny - Precision Correcter - The brush fell apart on this however I think it is a good product for cleaning up around the cuticle. La Roche-Posay Effalar K + - I didn't find this to to anything for my skin and so won't be repurchasing. Perhaps I need to try the duo + rather than this one. ELF - Zit Zapper - I didn't think the idea of this was very hygienic, originally it had a roller ball type applicator. I took that out and used a cotton bud to dab on spots. Won't be repurchasing. 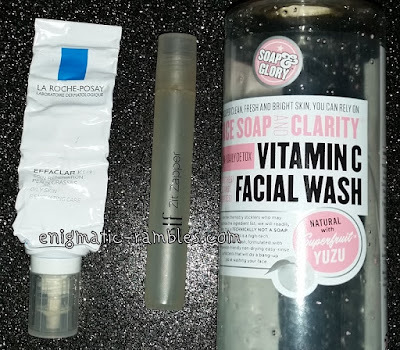 Soap and Glory - Vitamin C Facial Wash - I got this as part of a set, didn't mind using it up but don't think I would repurchase it. 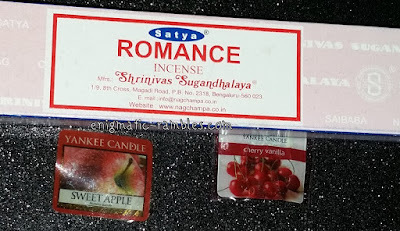 Satya - Romance Incense - Very floral and very strong. Too much for my small flat, maybe in a bigger space it wouldn't be as intense. I do like the brand though and do want to try some different scents in the range. Yankee Candle - Sweet Apple - Wax Tart - Sweet and vaguely apple, moderate scent throw. I did like it and wouldn't mind using one again in this scent. Yankee Candle - Cherry Vanilla - Votive Candle - Didn't have much scent throw to it, very vaguely cherry scented. Wouldn't repurchase. Lush - Karma Bubble Bar - Turned the water purple, nicely scented of Karma, a patchouli 'hippy' kind of fragrance. I would repurchase this, if they would take the glitter back out of it. Lush - The Comforter Bubble Bar - Very pink and berry scented, makes lots of bubbles. This is one of my favourite bubble bars. 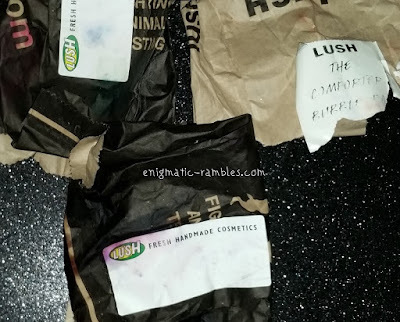 Lush - The Experimenter Bath Bomb - This one was okay but turned the water a sludge colour. I won't be repurchasing this one. 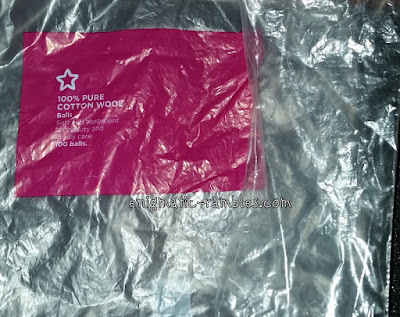 Superdrug - Cotton Balls - These ones were quite small but other than that were pretty standard cotton balls. I would maybe repurchase if I can't find any larger ones. Asda - Cotton Pads - Standard cotton pads, this was a duo pack so no need to repurchase just yet.